(a) Identify A, B, C and D in the below figure. (b) Name the parts of a pistil. (c) How pollen tube is formed? What is its function? 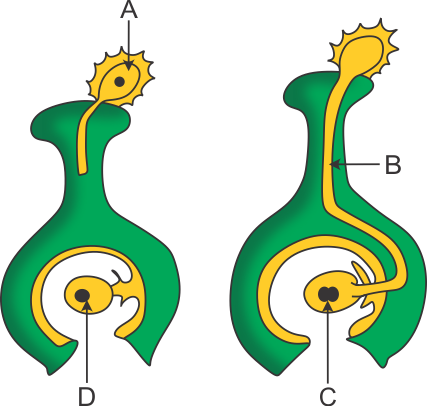 (b) A pistil consists of stigma, style and ovary. (c) After pollination, the pollen grains germinate on the stigma. A thin pollen tube grows down from the pollen grain which penetrates the stigma, passes through the style and the enters the ovule. It carries two male gametes which fuses with the female gamete.